Maplesoft today announced a major new release of MapleSim™, an advanced system-level modeling and simulation platform used by engineers to reduce development time and gain insight into system behavior. The latest release provides tools that increase engineering design productivity during model development, as well as significant additions to toolchain connectivity that offer even greater cross-tool compatibility and opportunities for co-simulation. Waterloo, Canada; January 17, 2017: Maplesoft™ today announced a major new release of MapleSim™, an advanced system-level modeling and simulation platform used by engineers to reduce development time and gain insight into system behavior. MapleSim enables engineers to take advantage of modern techniques in modeling and simulation, dramatically reducing model development time and risk while improving designs. 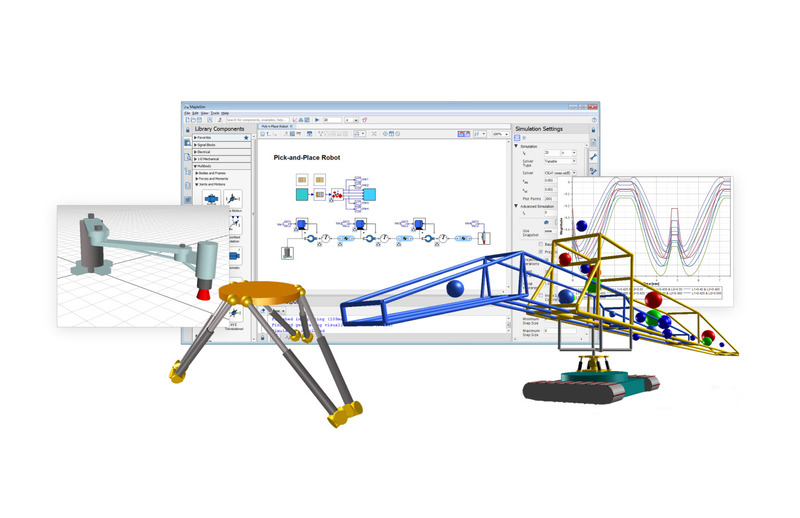 The latest release provides tools that increase engineering design productivity during model development, as well as significant additions to toolchain connectivity that offer even greater cross-tool compatibility and opportunities for co-simulation. To support engineering design productivity, MapleSim 2016.2 provides live simulations that let engineers see results as the simulation is running so they can track progress and investigate unexpected results immediately. Other improvements include a new 3-D overlay for comparing simulation visualizations, which makes it easy to see changes in the behavior of the model under different conditions, and tools for revision control that facilitate large projects involving multiple engineers working on the same model. The new version of MapleSim increases engineering design productivity and toolchain connectivity. The new release also includes significant enhancements to toolchain connectivity. In addition to exporting models to the internationally recognized FMI standard, MapleSimnow also supports direct import of models created in other FMI-compatible software, for both model exchange and co-simulation. Models exported by FMI-compatible modeling tools, such as LMS Imagine.Lab Amesim™ or Dymola®, can be easily imported into MapleSim and used like any other model or subsystem. In this way, engineers can immediately leverage models developed using other software while taking advantage of the advanced modeling and analysis tools of MapleSim when developing their system-level designs. For dynamic models involving multiple simulation tools, MapleSim now allows engineers to seamlessly connect models that run in other tools into their MapleSim system-level simulations. Enhancements to the MapleSim family of products also include expanded analysis tools for the MapleSim Battery Library and improved import facilities for the MapleSim CAD Toolbox. In addition, the MapleSim Connector for connectivity with Simulink®, and the MapleSim Connector for FMI for exporting MapleSim models to other FMI-compatible tools, have been expanded to allow engineers to explore simulation results involving exported MapleSim models from within MapleSim, even though the simulation was done in the target tool. MapleSim is available in English, Japanese, and French. Download this whitepaper today to learn more about how MapleSim is uniquely designed to handle sophisticated systems to minimize your development time and costs. Maplesoft has provided mathematics-based software solutions to educators, engineers, and researchers in science, technology, engineering, and mathematics (STEM) for over 25 years. Maplesoft's flagship product, Maple, combines the world's most powerful mathematics engine with an interface that makes it extremely easy to analyze, explore, visualize, and solve mathematical problems. Building on this technology, the product line includes solutions for online assessment, system-level modeling and simulation, and online STEM courseware. Maplesoft products provide modern, innovative solutions to meet today's challenges, from exploring math concepts on a smartphone to enabling a model-driven innovation approach that helps companies reduce risk and bring high-quality products to market faster. Maplesoft products and services are used by more than 8000 educational institutions, research labs, and companies, in over 90 countries.